BEFORE: For today’s exploration documentary, we venture to Mount Everest in The Wildest Dream. 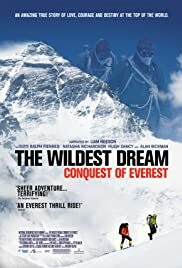 AFTER: When there’s a documentary about Mount Everest, there needs to be a unique story compared to other Everest documentaries. Once you see one person summit the tallest mountain in the world, any subsequent summits aren’t as impressive. Unless of course, there is a new element added to the climb that makes it unique. The Wildest Dream has that unique story. It’s not just about reaching the top of Mount Everest; the goal is to reach it in the same way George Mallory attempted in 1924, three decades before Sir Edmund Hillary ascended. The story was told very well, mixing Mallory’s story with Conrad Anker’s, the mountaineer who is attempting to recreate Mallory’s expedition. The back and forth between Mallory’s 1924 expedition and Anker’s 2007 expedition exposed information I had not known before and also produced some nail-biting moments as Anker approaches the summit. However, I was not a big fan of the historical recreations used to tell Mallory’s story. The clips just felt fake and out of place compared to the actual historical footage and the footage of Anker’s attempt. The filmmakers should have stuck with the historical footage and photos paired with Liam Neeson’s narration and Ralph Fiennes and Natasha Richardson reading the letters between Mallory and his wife Ruth. Adding the recreations took me out of the documentary and made it feel cheap. One question I would love to know the answer to: how do they get those cameras in places to shoot such beautiful vistas?